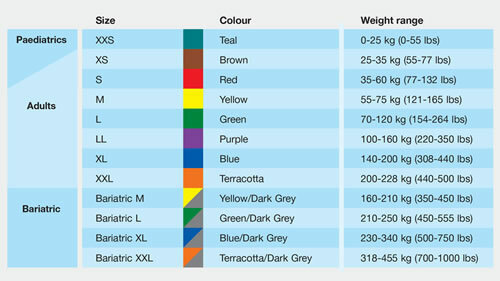 ArjoHuntleigh Bariatric Hammock Sling for patients needing greater stomach support. The Bariatric Hammock Sling is sometimes preferable for pear-shaped residents/patients as their stomachs are more prominent and require more support. The whole sling is padded with Spacer™ fabric, which is softer and disperses more heat, thereby helping to prevent a build-up of body heat and sweat for increased comfort and skin management. May be left under the patient when subject to a suitable risk assessment. 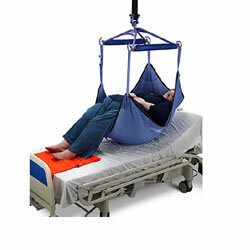 Suitable for transfers when patient is semi reclined and may also be used with amputee patients. May be suitable for patients who cannot tolerate leg straps positioned between their knees.